Conceived in the late 1990s and launched in June 2003, the Extractive Industries Transparency Initiative (EITI) has been a hallmark of international resource governance efforts and is now a global standard for transparency in extractive sectors. 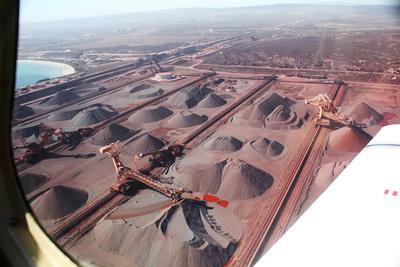 Initially designed as a voluntary process of extractive sector revenue disclosure for payments from companies to governments, the EITI has evolved into a broader instrument seeking to improve transparency and accountability within the natural resource management value chain, including corporate beneficiary ownership. A large number of resource dependent governments have committed to the EITI, which receives extensive support from donors, non-governmental organizations, and extractive industry companies. At the moment, the EITI has 52 members spread across all four major continents, including several high-income countries such as Norway, the United Kingdom, and the United States (Figure 1). 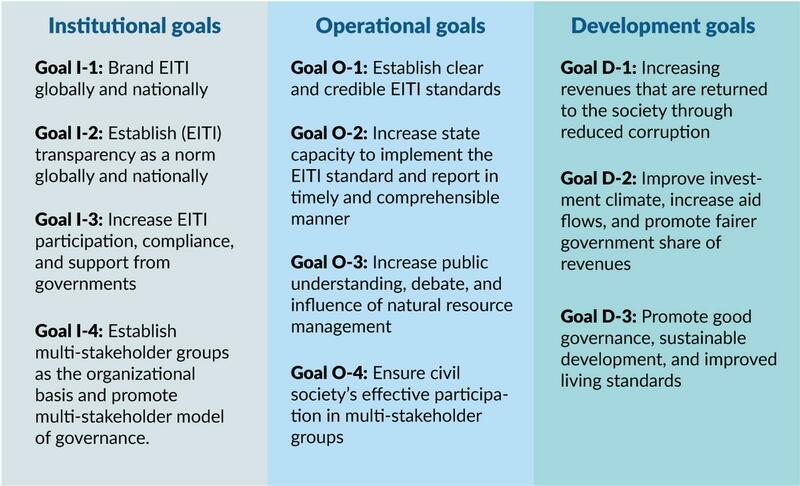 The EITI has articulated 11 specific goals, falling into three broad categories (see Figure 2). These goals are set out in the core EITI documents – the EITI Principles, the EITI Articles of Association, the EITI Requirements, the Overview of Validation, and the protocol on participation of civil society – all of which were included in the EITI Standard 2016. By early 2017, a total of 50 studies, either independent or commissioned by the EITI, had attempted to assess one or several of the EITI goals included in Figure 2. Table 1 sums up the findings of these studies, with assessments being characterized as either success, mixed (i.e. diverse outcomes within study sample, suggesting a partial success), or failure to reach specific goals. 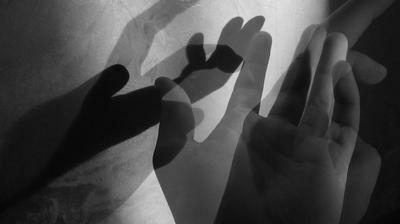 The table also notes when the study concluded that the analysis was ‘too early’ to strongly conclude on the findings. Although we provide an overall ‘success’ percentage for each goal, those figures only provide an idea of aggregate findings across relevant studies, but one should refer to the online appendix to better account for variations in the studies’ scope, methods, timeframe, sample size, and quality. As such, these aggregated assessments need to be treated with caution. Since about 2012, the adoption of the EITI has spread from mostly low-income and aid-dependent African countries to middle-income countries across all four major continents. (Figure 1). Thus, the existing evaluations deem the EITI relatively successful in increasing EITI participation and support from governments (Goal I-3). However, several evaluations consider the EITI either a failure or a mixed outcome in terms of country participation by pointing to the lack of adoption by some resource-rich countries that are also considered to be highly corrupt. Some of these countries include the petro-states in the Middle East and North Africa. Some evaluations also point at the ability of many governments to delay the actual implementation of the EITI and suggest that institutional adoption is mostly driven by external pressures – such as foreign aid dependence or the need for diplomatic and security support. Beyond the EITI itself, the initiative has also played a role in promoting and legitimating transparency as an international norm of governance, including through other resource revenue transparency instruments in the EU, US and Canada, as well as greater reporting by private and state-owned companies around the world. An indirect institutional contribution of the EITI has been to refine multi-stakeholder governance that came to prominence in the 1990s as a result of the ‘good governance’ agenda. In this respect, the EITI has frequently been touted as a novel and effective model of ‘tripartite’ governance between governments, companies, and CSOs, and the evaluations find that the EITI has been successful in institutionalizing of multi-stakeholder governance mechanism (Goal I-4). The EITI has been fairly successful in setting up standards for auditing and reporting (Goal O-1). The definition and implementation of transparency standards have been a major objective and operating mode for the EITI, for which the initial goal was to reduce corruption in extractive industries revenue management. The scope of the requirements was repeatedly criticized in the EITI’s early years for the data requirements not being detailed enough and for the EITI’s narrow focus on revenues flowing from companies to government, but the EITI Standard has since evolved to cover several other aspects of the natural resource value chains. There is so far little systematic evidence that the EITI has been successful in promoting public debate about, and action for, better natural resource governance (Goal O-3). This absence of evidence is in contrast to general perception that the EITI has contributed to international and domestic debates on resource governance. One possible reason for this lack of evidence is that civil society – and even more so the ‘public’ in general – is a diverse entity with dissimilar, and sometimes conflicting, objectives and expectations with regard to natural resource governance in general, and in particular with regard to how resource revenues should be distributed and invested. Two other possible reasons are that the EITI has to a large extent been a national-level initiative – with mostly technical discussions involving experts and activists – and little apparent relevance for the general public’s needs when it comes to information and changes to natural resource governance at the local level. Further, while the public may be well aware of resource revenue mismanagement, the space for public engagement can be severely limited due to repression or coercive forms of influence exerted by the central government, local authorities, and in some cases by traditional leaders. Policy options: compare the impacts and cost-effectiveness of implementing the EITI Standard vis à vis other targeted natural resource governance interventions.